GIVEN THAT ZAKI IBRAHIM has a musical interest that goes back to her childhood, it is hardly surprising that she has reached into her early influences to come up with a remarkable EP that goes under the intriguing name of Eclectica (Episodes In Purple). From the early beginnings of Zaki's musical road, she must have found pleasure in her talent. She went on to perform at Capetown's historic Armchair Theatre, then toured Canada with South Africa's Tumi And The Volume, The Roots and Bedouin Soundclash before arriving at her collaboration with famed DJ/Producer King Britt on her new EP. It is a road paved with creative encounters and enhanced by musical influences and experiences that have helped to propel her forward. 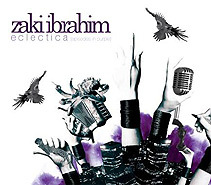 Zaki Ibrahim's enchantingly-sweet voice breaks through the musical notes and dances with them delightfully to produce a captivating vibrancy that resonates in the air in such a way that you hang on to every sound  Eclectica (Episodes In Purple) is an EP to be proud of. Her live shows played London, Birmingham and Manchester, and Zaki is yet another new artiste who has pushed out the boundaries. Her work is poetic, emotional and beautiful  "steeped," says the publicity machine, "in a delicious mixture of earnest emotion and social commentary. Zaki crossed the Atlantic to come back to the UK stage to hit clubs in Birmingham and Manchester for Bass Festivals that included Black Thought, Ursula Rucker, Lord Finesse, DJ Spooky, Tumi, Napo, Omekongo and Charlie Dark. She also made a special appearance at Canada Day's July 1 concert in Trafalgar Square, performing the songs from the EP. Then it was back to North America, where Zaki continued her tour, making stops at Montreal's Historic Jazz Festival on July 4 and Brooklyn's Hip Hop Festival on July 12. With her interesting mix of musical sounds, Zaki is one clever young lady who knows exactly where she's going. Her EP is full of joy and happiness, especially with Money which resounds with a celebratory African beat  and we can only hope that she'll find herself back in the UK again soon. For more information and news updates check out myspace.com/zakiibrahim and zakiibrahim.com/ecard/zaki_tools.html.  Eclectica (Episodes In Purple) was released on 28 July, 2008.